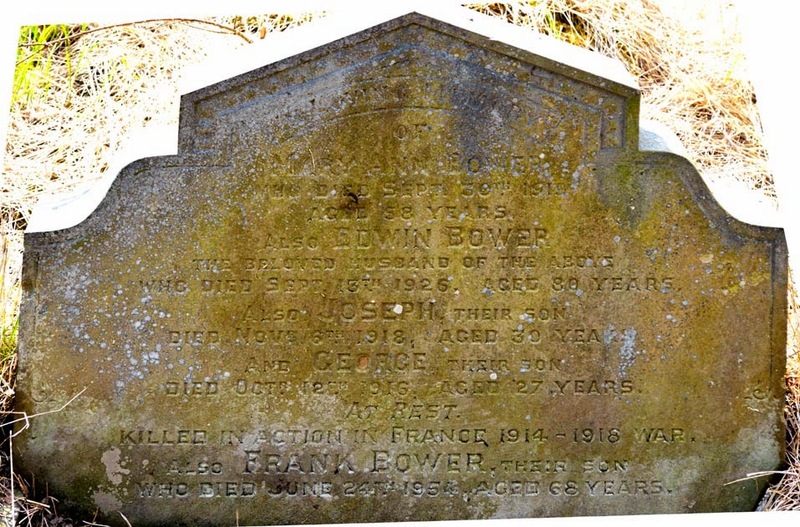 In Loving Memory / of / Mary Ann Bower / who died Sept 30th 1919 / aged 58 years / Also Edwin Bower / the beloved husband of the above / who died Sept 13th 1926 aged 80 years / Also Joseph their son / died Novr 6th 1918, aged 30 years / and George their son / died Octr 12th 1916, aged 27 years / At Rest / Killed in Action in France 1914-1918 War / Also Frank Bower their son / who died June 24th 1954 aged 68 years. Joseph and George are also remembered on the Silkstone All Saints WW1 plaque (originally in Stainborough St James) and on the Hood Green War Memorial, Hood Green Road, Hood Green. Joseph is buried in the St Sever Cemetery Extension, Rouen, France and remembered on the Commonwealth War Graves Commission website. George is buried in the Bancourt British Cemetery, Pas de Calais, France and is remembered on the Commonwealth War Graves Commission website.